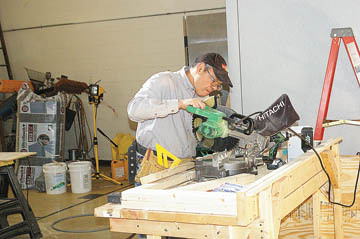 ROCKFORD—Bishop David Malloy found a couple of hours on April 5 to work with the St. Joseph and Sons group at St. Elizabeth Catholic Community Center on South Main Street, here. 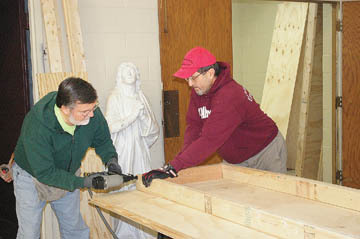 The “Joes” began working on numerous projects at the center on Saturday of the first weekend of Lent. 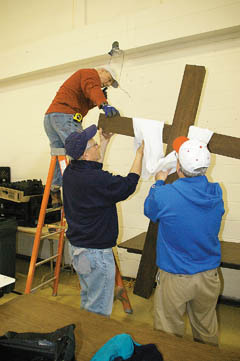 They continued working on the weekends that followed, calling it their Lenten project. 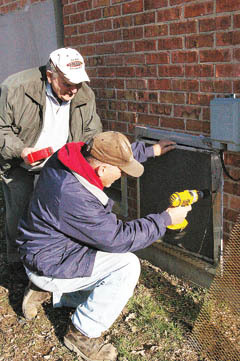 As often happens with repair work, some plans changed as they went along. For example, the job of cleaning the tile in the gym evolved when the Joes discovered terrazzo flooring underneath. Suddenly, they were removing the tile and stripping and refinishing the original floor. 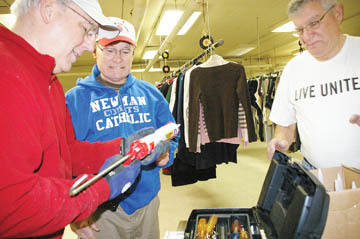 Staff at St. Elizabeth Center made lunch for the Joes each Saturday to thank them for their time and work, says Patrick Winn, director of Catholic Charities.